The sentiment shifted direction in China’s PP and PE markets as of the second week of May after players fully resumed their work following the long Labor Day holidays. Since then, import PP and PE markets have been firming up in China albeit slightly due to the fact that buyers retain their cautious stance, which puts a cap on the firming trend. 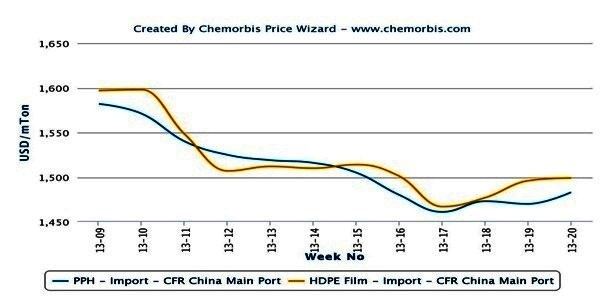 According to ChemOrbis Price Index, China’s import homo PP prices have gained $20/ton on average while the average HDPE film price has posted an increase of $30/ton in the past two weeks, as can be seen from the graph below. This week the sentiment in both markets has been hindered by easing crude oil prices as well as the lower LLDPE futures market, report many players in China. Hence, they do not deem large increases possible in the short term. 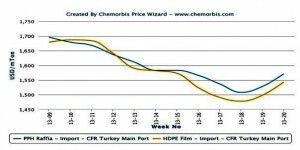 Turkey has seen larger increases relative to the Chinese market in the last 15 days. According to ChemOrbis Price Index shown in the graph above, the import PP raffia and HDPE film ranges have gained around $65/ton on average since the first week of May, although some players report much larger increases in several individual cases. Sellers mostly blame limited prompt availability for the sharp increases while many are still holding back from making offers in anticipation of further increases to come. 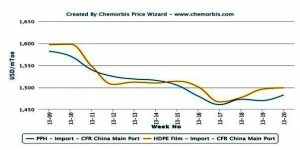 Indian PP raffia offers have moved $75/ton higher in the last two weeks. “The shifting sentiment caused panic buying last week; however, I am not sure if demand is really strong enough to support such large and rapid increases in the long run,” said a PP buyer in Gaziantep, South Turkey. A trader also reported receiving HDPE film offers from his European supplier with a €90-100/ton increase when compared to the latest deals he concluded. “The recent increases are set to cause a bubble. Even though sellers are holding onto their stocks, demand is still not good enough. If we apply a €100/ton increase this month, will the market be able to sustain another round of increases in June ahead of Ramadan? I don’t think so,” he said. Therefore, many buyers as well as some distributors think that the strong firming trend will not be sustained long in Turkey.